Feature: If you’re reading these lines, it’s because you want to know more. Helder Guimarães is a Portuguese-born performer, magician and creator of theatrical and immersive magic experiences. He is a World-Champion of Magic, two-time Parlor Magician of the Year by the Academy of Magical Arts and Ascanio Prize winner. 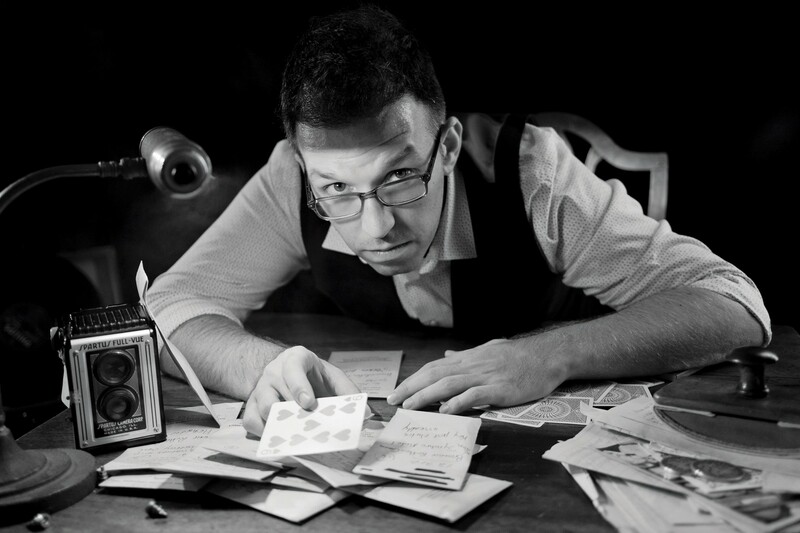 Known for his unique approach to sleight-of-hand magic, storytelling and performance, Helder’s work has been featured at the Kennedy Center, TED Talks and Off-Broadway productions. His previous creations include Nothing to Hide, directed by Neil Patrick Harris, the Los Angeles sold-out Borrowed Time experience and the Off-Broadway theatrical Verso, directed by Rodrigo Santos. The Los Angeles Times says, “He seems remarkably sincere and trustworthy for a man committed to deception,” and The New York Times recognizes him as “a Master of Illusions.” Using his knowledge of deception, he has consulted for major entertainment entities like NBC, Disney and Warner. As an example, Guimarães personally trained Oscar-winning actresses Sandra Bullock and Cate Blanchett for their roles in the movie Ocean’s 8. He lives in Los Angeles. Marshall is one of the premier film producers in the entertainment industry, with a career marked by classics like the Indiana Jones series, Back to the Future, Seabiscuit, The Color Purple and the Jason Bourne series. Marshall’s work has earned him five Academy Award nominations for titles as diverse as The Sixth Sense and The Curious Case of Benjamin Button. His recent productions include Sully, Jurassic World: Fallen Kingdom, and completing Orson Welles’s final film, The Other Side of the Wind. In November 2018, he and wife Kathleen Kennedy received the Irving G. Thalberg Memorial Award, an honor presented to creative producers “whose body of work reflects a consistently high quality of motion picture production.” In addition to his prolific producing career, Marshall is also an acclaimed director, having helmed Arachnophobia, Eight Below, Alive, and several documentaries, including the award-winning ESPN 30 for 30, Right to Play. An amateur magician since he was ten, he is currently directing Too Much Heaven, a documentary about the Bee Gees, and producing Diana, a musical based on the life of The Princess of Wales that had its world premiere at the La Jolla Playhouse in March. Moby has been making music since he was nine years old. He grew up playing classical music, but, after college, became a fixture in the late 80s New York house and hip-hop scenes. He released his first single “Go” in 1991 (listed as one of Rolling Stone magazine’s Best Records of All Time), and has been making albums ever since. His own records have sold over 20,000,000 copies worldwide, and he has also produced and remixed scores of other artists. Moby works closely with a variety of different charities, including The Humane Society, Mercy for Animals and the Institute for Music and Neurologic Function, and in 2007 he launched “mobygratis,” which provides free music for independent filmmakers. He owns and runs Little Pine, a vegan restaurant in Silver Lake, CA. 100% of Little Pine’s proceeds go to animal welfare organizations. No one under the age of 12 will be admitted to this production.